We are so close to Mickey's backyard, you can watch the fireworks right from your RV or take a shuttle to Disney from the park! Long, wide sites for any size rig. FREE Wi-Fi! Our friendly staff will make you feel at home! Staff was very polite, helpful, courteous, cared about guests. Park was clean, easy to navigate, well maintained and some noise from freeway. The shuttle service to Disneyland was easy and convenient hours. This was a great park. We stayed 6 nights. The convenience to Disneyland was terrific. The shuttle comes to the RV park and is on time and so much better than driving and parking at Disneyland. An added convenience was the availability of a dog-walking service. Make your reservation and they will walk your dog and refresh the water and feed them too. This makes it easy for you to spend the day at Disneyland without having to worry about rushing back to the park in the middle of your day. The staff was so friendly and courteous. The park was very well maintained. We did not use the bathrooms, but the outside of the building was clean and maintained so I imagine they were clean as well. A bit spendy for a premium site, but we will definitely keep them on our list for a return trip to the area. Stayed for one night at the Anaheim RV Park on our way to San Diego. No pull through sites were available, so we took a large back-in site accessible from the street in front of the park. Did not visit or use the pool, bathrooms or showers, but based on the general condition of the rest of the park, I would expect them to be clean and well-maintained. Great location to access Disneyland and easy access from I-5 freeway. $105 per night price (before Good Sam discount) was high, so I would look for better deals in the area when passing through next time. We stayed here for our 3-day trip to Disneyland. The spots were close together and the roads narrow, but the RV spots themselves were nice. The bathroom/shower facilities were well kept and the pool/hot tub provided a nice way to relax after a long day on your feet. The employees were all friendly and the shuttle service was incredibly convenient. The "continental breakfast" was really just a muffin, but we would definitely stay here again. Great shuttle location directly to the parks. Shuttle is not included with tickets. Staff helped insure our large rig was on a corner lot for easier backing in. Highly recommended. Watch fireworks fruition the park! I would never stay here again. It is in a VERY bad area. Disneyland is Very close, but safety is more important. There is no fence between you and street, in fact, the site we were put in was called a "preferred" pull through site. It was entered through the street, and the only thing separating you from street, was a sidewalk. very noisy and a lot of people walking around from outside. Not secure at all. very small too. felt more like a parking lot than a campground. take it from someone who lives in SOCal and has a Disney annual pass, do yourself a favor and PASS this place by. Not worth the $90 a night with taxes and fees. 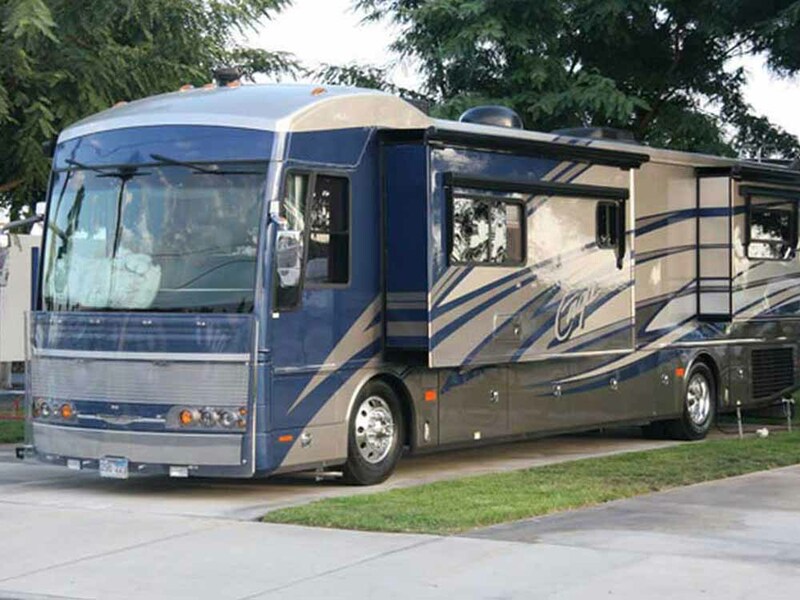 The Anaheim RV park is a very nice park in a very busy part of town. It is across the interstate from the Magic Kingdom, but has a good shuttle service to and from the park. Of note, the shuttle does not accomodate large strollers very well. The staff is very friendly and night check-in gentleman was very helpful getting us to our spot and making us aware of things going on as well as the bus schedule in the morning. The only slight detractor was the RV supplies in the shop. If you are needing some replacement equipment, you have extremely limited choices and should expect to go somewhere else for service items. Did a lot of research on rv parks near Disneyland and had this trip planned for a a long time. I made reservations about 9 mos in advance. I asked for and paid for a premium site and requested a specific one and they said they would do the best they could. (because it sits on public streets we wanted to be buried in the park a little for safety) The gal at the desk greeted us and said we got their best spot...Wow It was one spot from the city street, the front area was dirt and a little dead grass and it was on the end where their was a lot of traffic. I called the office and requested another spot and she gladly moved us to another one. The location was a little better but it was very tight and the front door of our rig opened to our neighbors sewer. there was barley room for the picnic table and I had to back my truck right up to it (not that we would use it because it was almost right on top of a sewer line and looks like it had been overflowing. Had to keep our windows closed to keep the smell out of our rig. I have seen a lot of posts about great security, in 5 nights there I did not see any security at all. I will mention that only one night we saw some sketchy people around but the rest of the time we did not feel in danger. Would be great if they could fence the place. The restrooms near the pool were horrid. Moldy and dirty...eeewww. The restroom building in the center of the park was nice. The people were friendly and it was a great location...If we go to DL again I would consider staying there but would insist on one of the nice sites. We arrived late, at 09p.m. and the night angel was waiting for us with all the important information. At the morning we did the check in and met the most nice and helpfull stuff. The site itself is very clean and located perfectly nearby everything. Showers are abit old but still clean. We highly recomend!!!! From the moment we checked in, we were greeted by very friendly front desk staff who gave us some good ideas about activities in the area and who were just amazing. Found our spot very easy, more then enough room to pull into and get set up. Space was roomy, very close to bathrooms and other facilities. The park was very clean. The location is awesome, very close to lots of activities. Being a very new rv'r, I would recommend this park to anyone. We stayed at Anaheim RV Park for 4 nights while visiting Disneyland. We are brand new RV owners, and this was our very first trip in our 22' travel trailer. Upon arrival, the staff at the park was very friendly and welcoming. They were eager to oblige requests from us (my daughter asked for a pin or a pen, and was happily given both!) and other guests in the office. We were quickly assigned a site and given a folder loaded with information about the park and the surrounding area. The park offers complimentary muffins (which our kids loved! ), coffee, tea and newspapers to guests every morning. There is a small retail area in the office that sold a few essentials and novelty items, and I believe there is also a meeting room. The park offers Wi-Fi; 750 kbps is free and 5 mbps is available for a daily fee. We did register for the free Wi-Fi, but wound up using our mobile data most of the time since our Wi-Fi connection wasn't great from our location (we had a great 4G signal from Verizon). Our standard back-in site was clean and level and was shaded by a large, beautiful tree. We had a picnic table, electric, water, cable and sewer at the back of the site, and plenty of room for our slide out. We had a bit of trouble getting our cable connected (it was our issue, not theirs), and the gentleman who maintains the park was at our site to help before I could even walk back from the office! Our site (525) was adjacent to the dumpster, but it was never a problem - we even had a great view of Disney's fireworks right from our trailer! The park is extremely clean and quiet, and there were plenty of well-maintained restrooms throughout the property. The bathrooms in building 300 appeared to be newly renovated. They were private (shower, toilet and sink in a single, locked, code-accessible room) and were large with updated tile work. There was even a soap dispenser in the shower! There is also a nice, gated pool and a small grassy dog park, complete with pick-up bags, that we did not use, but did walk by. The park is a 5 minute drive to Disneyland, and the Anaheim Resort Transit also picks up just outside the park office for those that choose not to drive. There is a nice Walmart Neighborhood Market about half a mile away, too. Overall, we had a wonderful stay and a fantastic introduction to camping - we highly recommend Anaheim RV Park, and will definitely return! This being our 4th stay, by ourselves, then with kids, then by ourselves and now with kids and grand kids. Park is what it is as a park should be. Clean restrooms and showers, quiet, simple parking and simple hook ups. the grass area at the site is great while you are kicking back. left grill and other things out and again no issues. Staff was of course as nice as you would expect and helpful in providing information about surrounding stores, activities etc. Would we stay there again, yes, as stated this is our 4th time. Happy Campers once again! ! ! Everything was amazing! Very clean Park! Loved that there were laundry facilities that took credit cards as well as coin operating. Great place to stay if visiting Disneyland. Fireworks at Disney could be watched from RV park. Need a fenced in dog walk. It showed one but was not there. One more thing is you can only stay 2 weeks and have to move on. I would recommend this place very friendly people and helpful. My sons and I stayed here to visit Disneyland this summer. it was WONDERFUL and we LOVED it. The staff was very nice and went out of their way for us. The facilities we clean, well maintained and nice. The proximity to the park was the best. We took the bus over. It was so close we came back for lunch and then went back until close. And the added bonus was you could see the park fireworks from the rv park pool!!! We watched the fireworks in the pool the first night before we went to the parks. The park was very family friendly. We had a blast and would go back in a heartbeat. Plus the price was such a great deal. Very close to Disney with shuttle service! Clean and well kept. Laundry facilities clean and reasonably priced. Pet friendly, even offering a dog walking service. Staff very attentive and friendly. Perfect location for near by theme parks. Great family and pet friendly park. Had a quiet stay and had no issues with other park members. Kept clean and cared for. Even had a laundry room for use which made our 2 week stay great. The price was reasonable. Spaces are small but had picnic table, shade, and enough room for what we needed. I would recommend a stay here and will be visiting again with my family for sure. We are old and traveling with an older friend. We have 2 Scotties and he has a teacup Bichon. Total weight for all dogs: 46 pounds. Another park nearby had very strict pet rules and we could not walk to the dog area 7 times per day. An RV park in Long Beach only allowed 2 dogs. We arrived here and made trips to Long Beach to visit the USS Iowa and the Queen Mary and then the Nixon Library. Went to Medieval Times for fun. Google maps really saved us time on the freeways and we didn't have to leave the dogs more than 3 hours on any excursion. Anaheim RV Park had plenty of room for pet walks near our space. Everyone there was very helpful and friendly towards me and we would stay there again. We hope to return in the spring. Great facility, great price, clean, helpful staff, free muffins in the morning, easy access from highway and right around the corner to Disneyland. We saw fireworks from our spot. Would definitely come back. So convenient to Disney with the bus system available. Sites are large and great to have trees around .Tours are also available from here into LA which we took from. You don't need a car here to get around. And where else do you get muffins and coffee every morning from the office and you can see the fireworks from your site every night, too. This was our first year camping in Disney after years of paying $3,000-$6,000 to stay on the Disney property. So we were very nervous about the experience. The minute we pulled into this place our hesitations were gone! Very convenient pull in and registry area, large enough for class A's towing a car. The staff was phenomenal! Very friendly and helpful. We reserved a premium pull thru site that had trees for cover and a little grass, a novelty for Southern Arizona residents. Sites were very well maintained, bathrooms were new and spotless. While only a short five minute shuttle ride to the Disney parks, you do not feel it inside this RV park. It is a pet friendly place but you rarely hear anyone's dog. Folks seem to walk them in the morning and at night but that's all you know of pets in the park. We loved the feel of the place, the fantastic people we met as you always do when RV'ing, and saving $2,500 on this year's Disney trip. Will most definitely stay here again!!! While this is a great campground for those going to Disneyland or other Anaheim attractions, do not expect a Resort. It is a good campground but for anyone wanting a resort, you should look elsewhere. Good for families. We stayed there in January of 2015. It is the most immaculate RV resort I have been to. It is well organized, clean, convenient, and has every amenity needed. The shuttle to Disneyland is every 20 minutes, on time each time,and is right on the RV property. The convenience made it a joy. We have a 33 foot Class A and we fit perfectly with plenty of room on the sides for our awnings. The office staff is not only efficient but also friendly. A++++++ and we will stay there again. The staff at this campground is exceptional. The sites are decent size. The biggest selling point for us on this campground was the proximity to Disneyland, and the shuttle service that is provided. Have stayed here three times this year. Clean park. I appreciate the after hours security for peace of mind. Park has both shady spaces and open spaces for satellite. Staff is friendly and helpful. Looking forward to returning next Spring! There's a lot happening in and around Anaheim. Come and stay a while, you'll be surprised and inspired. From Disneyland to Angels Baseball and Anaheim's revitalized downtown, as well as beaches, golfing, luxury shopping and more. You will experience unforgettable moments.